March 24, 1909: Municipal Journal and Engineerarticle. Disinfecting Water at Poughkeepsie. “Sedimentation is ineffective because there is nothing to be precipitated, coagulation is ineffective because there is nothing for the coagulant to attack, the efficiency of the filters is not as good at this season of the year, so disinfection is being tried. So far the results have been marvelous. By the simple adding of the disinfectant (chloride of lime) to the raw water, as if by magic the purification is complete. The hypochlorite is added in the pump and the water then passes through the sedimentation basin. The last bacteriological result shows a reduction from 17,500 to 100. The filters continue to assist in the purification, but there is no necessity for careful regulation. At present we are adding the disinfectant at the rate of one-half part of free chlorine per million, which figures about 36 pounds of hypochlorite per day for our consumption. There is absolutely no taste or trace of the chlorine in the filtered water, the process is simple, safe and complete. The expense at our present rate is 75 cents per day, where it has been as high as $10 for alum. The suggestion that this disinfectant method be followed came to us from Mr. George C. Whipple, of New York City. The accompanying cut shows the general layout of the purification plant. The water takes the following procedure: It is pumped from the river into the inlet end of the sedimentation basin, a total lift of about 50 feet; the water then passes through the basin and out at the outlet end, thence by pipe line into the intermediate basin from which it is distributed to each one of the filters. From the filters the water passes to the clear water well and thence back to the station, where another set of pumps sends it to the College Hill distributing reservoir. Reference: Harding, Robert J. 1909. “Disinfecting Water at Poughkeepsie.” Municipal Journal and Engineer. 26:12(March 24, 1909): 484. Commentary: Chlorination began on March 17, 1909, as noted in a post on this blog. 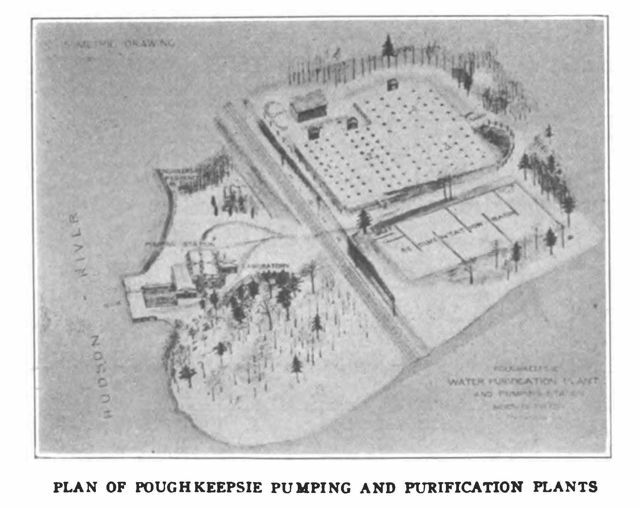 Poughkeepsie was the third documented use of chlorine for drinking water disinfection in the U.S. as noted in the book The Chlorine Revolution: Water Disinfection and the Fight to Save Lives. This entry was posted in Year 7 TDIWH and tagged chloride of lime, chlorine, drinking water, George C. Whipple, New York, Poughkeepsie, public health, slow sand filtration, The Chlorine Revolution, water, water history on March 24, 2019 by safedrinkingwaterdotcom.